Aquaponics is the most efficient food production system in history. Healthy food is at your fingertips. Know and eat what you grow. Aquaponic gardening gives you the freshest organic foods available at your fingertips. Aquaponic gardening is quickly becoming a popular way to produce a sustainable healthy food source both privately and commercially. By combining conventional aquaculture, which is raising fish or aquatic animals in tanks, with hydroponics, which is the growing plants in water without soil, you can create a symbiotic ecosystem which produces edible foods efficiently and at very little cost. 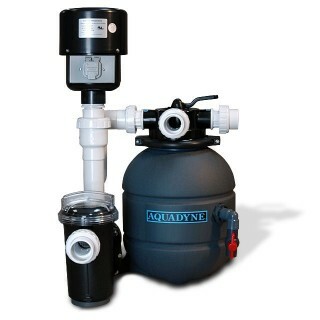 The key to success with any Aquaponic system is proper filtration. Only having water circulate between the fish tanks and planting beds will usually end in a toxic environment that will not support life for the fish or plants. The Aquadyne Ecosphere provides the perfect solution to a biologically balanced Aquaponic system to maximize the production of both healthy fish and plants for a toxin free source of food. Worried about eating the fish that you have grown and come to care for? Not to worry, simply enjoy your fish inhabitants as pets and use their waste products to produce the healthiest green crops you can eatwhile avoiding pesticides and toxic chemicals that are used in todays mass produced food sources. Call us today for more information 404-281-9633.